Channel Setting | Metalwerx, Inc.
Gemstone settings are often named with a term that describes the way they actually hold the gems in place, and the term channel setting is no exception. Channel setting is a method whereby stones are suspended between two bars or strips of metal and flow side by side in a continuous row. As with all jewelry, there can be many variations of channel work and the technique has become increasingly popular over the last decade. This style is often seen in wedding bands and is also used as an accent on either side of a larger stone, for example, to highlight a diamond in an engagement ring. This course presents a great opportunity to advance stone setting skills with hands-on experience and knowledge from an expert in the jewelry industry, John Kennedy. Over the course of two days, students will be taken step by step through the process of channel setting through two ring projects. 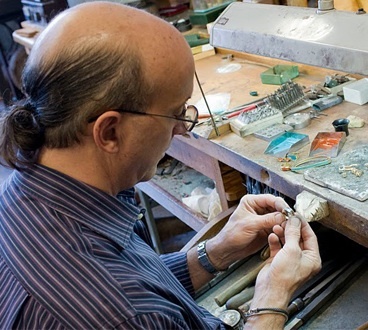 To save time, ring mountings will be prepared in advance so students can focus on stone sizing, layout, cutting seats, setting, and finishing methods. Expect to leave with a finished channel set ring in sterling silver. Students can move on to work on a second ring as time allows and continue to refine skills. The goal of this workshop is to lay a solid foundation for students to continue exploring this setting style after the workshop. There is an estimated materials fee of $40 which includes one Argentium Silver ring blank in the size you choose as well as cz's to complete a ring project(s). Students should send their ring size when registering for the workshop (but we'll also double check when we get closer to the class). Additional ring blanks ($25) and stones ($15) are available by request. Optional Add-on to kit: Students are required to have a series of burs for the class. Metalwerx can provide those in a kit for an estimated $40, or students can bring their own. Registered students will be contacted three weeks prior to the workshop to place their orders. Rotary attachments needed include:0.4mm Round bur, 1.80mm Bud bur, 3.10mm Bud bur, 2.90mm Heart bur, 3.10mm Heart bur, #66 Drill bit (.033), 1.40mm Drill bit.